G1 Bumblebee from cottonon. Card a bit warped but okay. 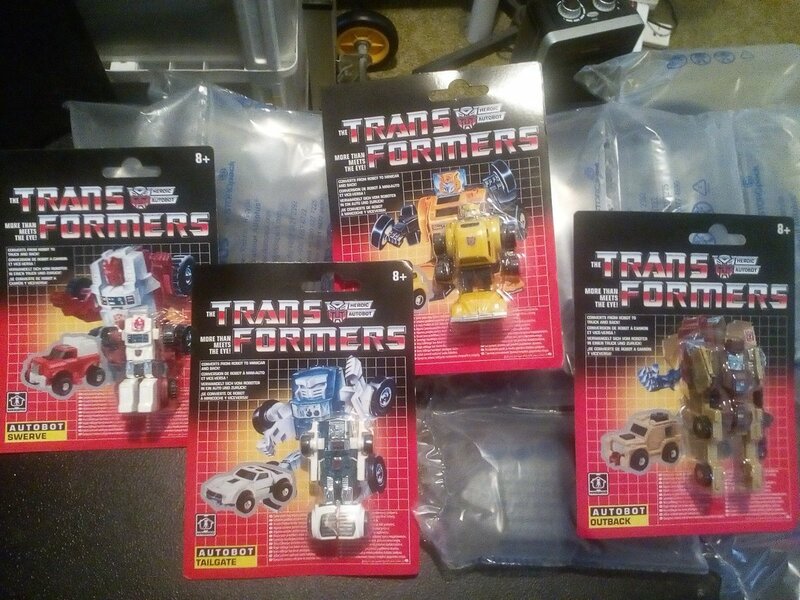 Full set of G1 Minibots from Cotton On in better condition this time. Yay! So I sent Cotton On an email about my bent card, and they apologized and said they'll bring it up with upper management. They also gave me a discount off my next purchase. I won't say how big a discount it was, but it was good enough to provide an incentive to buy the whole set! REMEMBER: If you plan on keeping your figure MOC/MISB and you're buying online, make sure you message the vendor telling them to pack it well! Finally received Punch/Counterpunch from Amazon today. Who delivered it Fastway,Toll, UPS or Aust Post as im curious because i ordered one myself from amazon and im wondering who to expect? I use this. And when you enter the tracking number it should tell you which company it has been transferred to with a new tracking number. In my case it was Fastway.